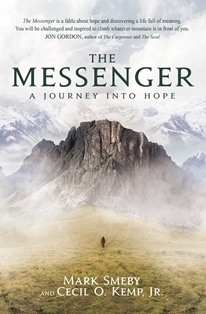 The Messenger: A Journey into Hope (BroadStreet Publishing, March 1, 2016) by Mark Smeby and Ceil O. Kemp, Jr., addresses this problem and brings the reader on a journey that challenges us to forgo fear and climb the mountain in front of us. The Messenger is a novella about an average family that lives in the mountainous village of Bergland in Norway, a place where life is mostly uneventful, even mundane. Bound by Janteloven (the law of Jante), which has been bred into their thinking since childhood, the villagers have little ambition beyond that of living their lives in much the same way as their parents and grandparents before them — a life characterized by bland routine and stifled curiosity. A life that in many aspects is stagnant. But there is no such thing as a life without events including heartaches and problems as Thomas and his family discover when little Anna falls sick with a debilitating illness. Thomas and Lena have three children — two thriving boys and Anna who is progressively waning as each day passes. She will likely die. This is not Thomas’s first time face-to-face with the death of a child. As a young boy, he had watched his best friend drown before his very eyes. Unable to bear the thought of another untimely death — that of his own daughter — Thomas makes it his priority to find a way to help her, even if it means stepping out of the acceptable comfort zone and choosing an unconventional almost “taboo” pathway. Thus his journey up the mountain begins. While the story is well written and sweet, I struggled with a few points. Thomas’ character is too compliant. He would be more authentic if he were to be a little less mild, a little more resistant to the truth offered to him by Sophia, an old lady and complete stranger that he meets on the mountain. Furthermore, the scene in the church where Thomas stands up and speaks in the middle of the sermon, inciting people to wake up and seek truth is troubling. Although his words were valid, his method was disruptive. To interrupt a pastor in speech and then to walk out of the church taking a couple of folk with him could be seen as divisive. Criticism aside, the story makes for an easy read with a simple message. 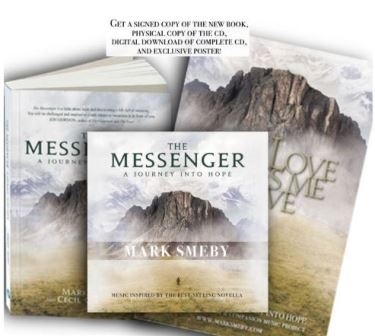 Mark Smeby’s musical CD with the same title, The Messenger, is pleasant, easy listening. Mark’s voice is deep and his songs full of meaning, but variety is lacking. Both book and CD provide Christ-centered relaxing entertainment. Photo captions: 1) Book cover. 2) Mark Smeby. 3) Ceil O. Kemp, Jr. 4) Louis and Janey DeMeo pictured in the studios on the Holy Spirit Broadcasting Network (http://hsbn.tv), after doing an interview there. About the writer: JaneyDeMeo is the founding-president of Orphans First — a Christ-centered non-profit ministry helping underprivileged children around the world. She is an author, freelance writer and Bible teacher — and has worked with husband, Louis, as a church-planter in France. Her website is: www.orphansfirst.org.